successfully manage mental health at work. This course is nearly full, so bookings can only be made by telephone or email. Please telephone us on 0208 344 2328 or email info@atworkpartnership.co.uk if you are interested in booking. 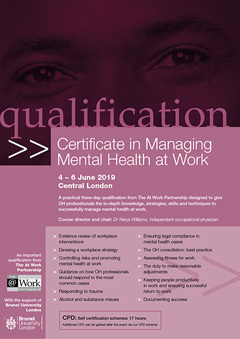 This practical three-day qualification, organised by The At Work Partnership with the support of Brunel University London, is designed to give OH professionals the in-depth knowledge, strategies, skills and techniques to successfully manage mental health at work. It covers a wide spectrum of issues including promoting good mental health at work; assessing fitness for work; reasonable adjustments; and reducing presenteeism and sickness absence through prevention, support at work and effective return-to-work programmes. The course brings together some of the leading experts in their fields and is taught using a combination of lectures and group work. The course director, OH physician, Dr Nerys Williams, and course deviser, Occupational Health [at Work] editor Dr John Ballard, ensure that the course is pitched at the right level to appeal to experienced OH professionals. The outstanding expertise of the lecturing team will ensure that you come away with the detailed knowledge and skills to successfully manage mental health in your own workplace. How will gaining this qualification benefit you and your organisation? Gaining this qualification will help you to employ the right strategies and interventions to successfully manage mental health in your workplace and create a more engaged and productive workforce. The course is designed for OH professionals. Other professionals with responsibility for OH and/or the mental health of employees may also benefit from attending. Delegates must attend at least 80% of the course. Following the course, students who successfully complete an assignment, demonstrating their understanding of the theory and skills taught in the course, will be awarded the Certificate in Managing Mental Health at Work. This qualification is organised by The At Work Partnership with the support of Brunel University London. The Department of Clinical Sciences is part of the College of Health and Life Sciences at Brunel University London. It specialises in courses that enable graduates and postgraduates ‘to make a real difference to the world around them’. The Department has four divisions i) Occupational Therapy and Community Nursing, ii) Physiotherapy and Physician Associate, iii) Social Work and iv) Health Sciences. Book and pay before 15 April 2019 and save up to £100!